Sand and mud are flying at North Street Beach on Tuesday morning (Nov. 3) as the north end beach replenishment project kicks into high gear in Ocean City, NJ. The dredge Illinois is moored a short distance off Surf Road Beach in Ocean City, and a $9 million beach replenishment project is underway. 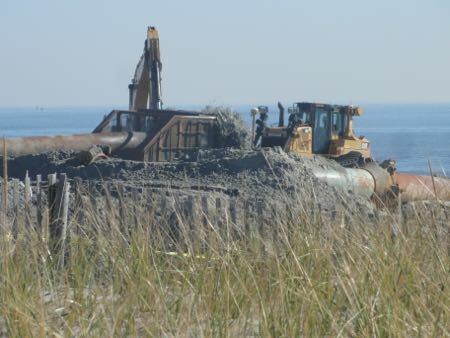 Bulldozers begin to shape the new beach at North Street in Ocean City on Tuesday morning. 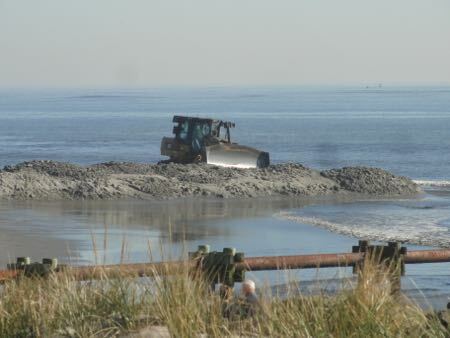 The dredging project will pump 700,000 cubic yards of new sand to rebuild eroded beaches from the “terminal groin” (the first jetty at Seaspray Road) to the area around 15th Street. The project is expected to take between 45 and 60 days. 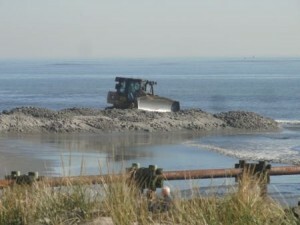 The dredge will pump sand through an underwater feeder pipeline from an offshore borrow area to the beach at North Street. The work will begin at North Street then proceed northward toward Seaspray in the first phase over the course of about 10 days, according to Richard Pearsall, spokesman for the Army Corps of Engineers Philadelphia District. A second phase would then cover the area from North Street south to 15th Street. Get the Daily. Sign up for free email updates. The beach entrances at North Street and along Beach Road were closed on Monday and Tuesday as work commenced. Work is continuing around the clock with spotlights on the beach and the offshore dredge lit up on the horizon. 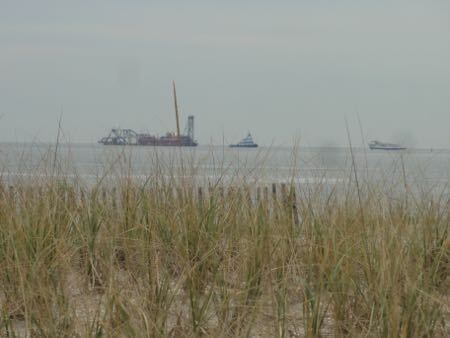 The dredge Illinois sits offshore at the north end of Ocean City on Monday afternoon (Nov. 2) and will begin to pump 700,000 cubic yards of new sand to help rebuild eroded beaches.